My immediate reaction is that it’s hard to imagine MacBride spent more than a year writing about the business of guns and learned so little. 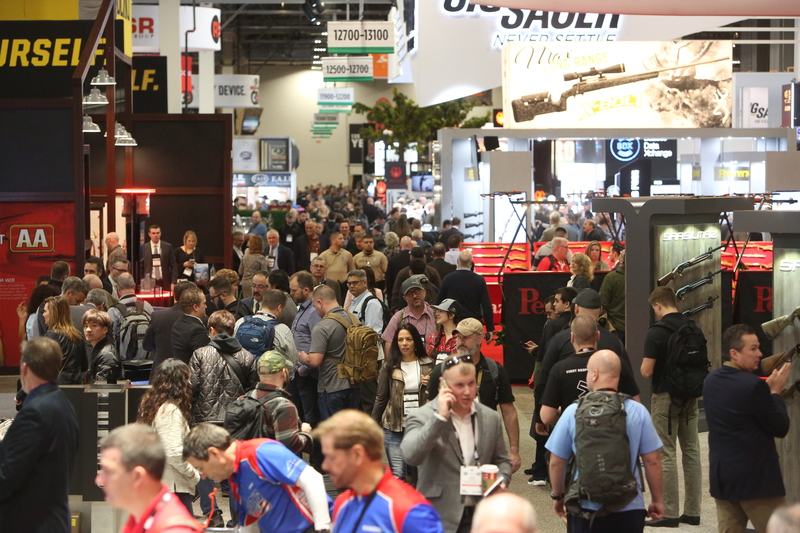 SHOT Show floor. Courtesy of National Shooting Sports Foundation. I don’t want to waste time with a systematic and comprehensive response, so let me just comment on a few of her points. A couple basic problems here. First, notice how she slips from the way guns are “marketed” in the first sentence to the reasons guns “are bought” in the third sentence. Does she have evidence that the way guns are marketed determine the reasons for which they are bought? Although anecdote is not the same as data, I can report that I think Bushmaster’s “Man Card” ad was stupid and I bought a Bushmaster AR. Not because of the advertising, but despite it. I don’t doubt there is some relationship between marketing and demand, but I suspect it is more complex than MacBride suggests, including that marketing at times follows demand rather than leading it. Second, she asserts that “the larger share” of guns are bought as “tokens of political belonging and as luxury brand items” without a shred of evidence for this assertion. The fact that we don’t know “exactly how many guns are sold in the United States” has nothing to do with it. We know from surveys that people increasingly say they own guns for self-defense, though many still own them for recreation (hunting, target/sport shooting, collecting). Do some people buy guns to express their political beliefs and belonging? Certainly. Do most or even many do this? Certainly not. To be sure, “gun owner” is becoming a more salient political identity, but that is not the same as saying that people are buying guns as tokens of political belonging. Rather, more fundamental in-group/out-group dynamics are at play here, with the stigmatized out-group being gun owners who become politically activated in defense of themselves. MacBride returns again to the idea of guns as luxury items later in the essay, problematically. Although it is true that most people do not buy 10 chain saws, I have more than 10 tools I use for yard work on my home, Two Oaks Estates. I have a (1) lawn mower, (2) trimmer, (3) blower, (4) shears, (5) lopper, (6) hoe, (7) stiff rake, (8) leaf rake, (9) shovel, and (10) spade, and more. Ditto for woodworking tools. Ditto for tennis rackets. I own more than 10 fountain pens, each of which do somewhat different things for me. The same is true of guns. A long time ago I wrote about how a person could easily develop an “arsenal” of guns for defense, collecting, sport and fun. Looking just at guns for protection, it is not unreasonable for someone to have a home defense shotgun, an AR platform rifle, a full size pistol, a smaller carry pistol, and a subcompact pocket pistol. 5 guns, to start, which of course cost money, but none of which are meant to exemplify a person’s wealth. Of course, we do well to remember that the average gun owner does not own anywhere near 10 guns. According to the 2015 National Firearms Survey, the mean number of guns owned is 4.8 and the median is around 2. To be sure, conspicuous consumption happens, in many areas of life, including in gun culture. Early in my journey I learned the term “BBQ Gun.” This is a gun – often engraved and polished with custom (perhaps ivory) grips – worn in a fancy tooled leather holster typically at BBQs, church gatherings, weddings, and other special events. But in general, to the extent that people like to “show off” their guns, it is not usually as a display of wealth but as a recognition of their technological capacities or historical significance. I think of it as being less like Monterey Car Week and more like people parking their cars in the grocery store lot and popping the hood so other car aficionados can appreciate them. Tags: Business. Bookmark the permalink. She would probably be shocked at the number of wrenches in my toolbox, too. But each does something different, i.e., 4,5,6,8,9,10,11,12,13,14,15,17,19,22 mm, etc. And then there are the allen wrenches. OMG. Do you suppose Ms. MacBride has more than one pair of shoes? Why of course. Some of the stuff we do up at the national lab, for example, classified under the Atomic Energy Act of 1946. But small arms being classified? To be polite, that would surprise me. I think she spent a year largely reinforcing her own prejudices. Her comment early on about her family history of military service is irrelevant. Was she herself in the military? Doesn’t sound like it. The experience of military dependents with weapons is vastly different than that of the military member. There’s also a minority of military out there, usually higher ranking officers, who are anti-second amendment. So her military family hole card is really a joker. The whole attitude of the article is smug condescension, from the title, right on through. Guns are “…toy for grown-up boys, and increasingly, grown-up girls.” The second amendment is most decidedly not a marketing slogan. It certainly has been used in marketing, granted. But, and this is the biggest ‘but’ with the article, and the issue that makes me really grind my teeth in frustration, but she’s taken the second amendment, which codifies the liberty which separates the free from the enslaved, and reduces it to bad advertising. The reporter needs to go get a history lesson on the causes of the Revolutionary War that her ancestors fought in, and the events of April 1775 that turned it from a war of words and protests into a war of bullets and bayonets. Your comment about chainsaws struck a chord with me. It reinforces that some aspect of the divide over guns and their role in society is related to status and the environment one works and lives in. We live in a working ranch now. Our neighbors are ranchers and farmers. It’s not uncommon to have multiples of important tools because one can’t lose valuable working time when a tool isn’t working properly. We actually have several different chainsaws of varying power and bar length to address redundancy and task specific design. Same for other common tools: hammers, saws, drills, axes, tractors. You get the idea… People whose living depends on weather and work efficiency invest in tools because we can’t buy more time or better weather. You see the same thing in construction and maintenance trades. In our community it’s common to find a selection of firearms in every household. Handguns are convenient when working and often carried to deal with predators or vermin, even in town. Rifles and shotguns are for more deliberate work when one has the convenience of keeping one at hand in a way that doesn’t interfere with the main task. I suspect people who work in large cities protected by responsive police and pest control don’t understand the need to handle things immediately because they have the luxury of calling a responsive professional. I experienced this culture when I was stationed in D.C., where people tended to hire out unpleasant tasks. Waiting for the sheriff or other official response isn’t an option for many rural plcommuntities or working class neighborhoods. Thus, a gun culture exists alongside a general self-reliance culture that emphasizes basic knowledge basic life skills: first aid, changing the oil in the car, etc. I think the divide is along lifestyle lines between knowledge workers and people who create or maintain real things. The latter cannot reason away problems or defer to others, so they learn to deal with them. It’s hard to divide gun culture from the rest of culture. America has many cultures, each with their own values and accepted behaviors. That’s a good thing. It’s best to keep it that way by emphasizing individual responsibility and liberty.